A two-phase, NbCrTi alloy (bcc + C15 Laves phase) has been developed using several alloy design methodologies. In efforts to understand processing-microstructure-property relationships, different processing routes were employed. The resulting microstructures and mechanical properties are discussed and compared. Plasma arc melted (PAM) samples served to establish baseline, as-cast properties. In addition, a novel processing technique, involving decomposition of a supersaturated and metastable precursor phase during hot isostatic pressing (HIP), was used to produce a refined, equilibrium two-phase microstructure. Quasi-static compression tests as a function of temperature were performed on both alloy types. Different deformation mechanisms were encountered based upon temperature and microstructure. 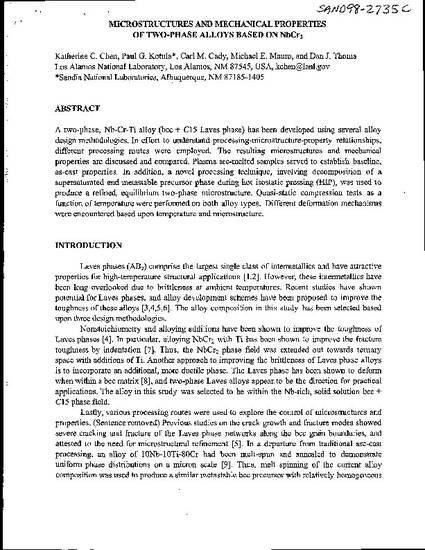 © 1998, Materials Research Society. All rights Reserved.